I highly doubt that there is any girl out there who does not feel fantastic wearing at least one piece of jewelry. There is something about wearing your favorite jewel that makes you feel comfortable, attractive and feminine, all at the same time. Even if you are not the type to adorn yourself with jewels, there is probably at least a ring you love wearing or a pair of discrete earrings. No matter what piece you choose, a properly picked jewel can give you an extra boost of self-confidence that anybody needs. The most delightful part about several jewels is that they have incredible powers, that come in the form of healing gemstone jewelry. There are tens of semi-precious (and four precious – diamond, sapphire, ruby, emerald) stones that serve as the base piece for jewelry manufactured and sold all around the world. All of these stones possess mind-blowing healing abilities and delightful properties that enhance your soul and mind. Nowadays, pieces of jewelry crafted with healing gemstones are becoming more and more popular as people begin to discover their astonishing properties. Why not make the best of both worlds and combine beauty with well-being? See our favorite 5 gorgeous types of healing gemstone jewelry and let us know which piece you love wearing the most to protect your soul! Some of the most sought-after pieces of healing gemstone jewelry are, without a doubt, necklaces. Healers and crystal lovers alike adore necklaces designed with their favorite gemstone to wear even on a daily basis. Many people choose to hang their preferred stone from a thin, silver chain, whereas others enjoy necklaces made entirely out of beads. From a healing point of view, the properties and effects of the gemstone depend on the length of the necklace. If your piece rests at the base of your collar bone, it enhances your throat chakra and focuses upon developing the skills connected to it. That means that you are promoting open communication, imagination and creativity. It is also a great point for the energy from your gemstone to communicate with the rest of your chakras and your entire body. If your chain is slightly longer and hangs in the area of your heart chakra, it means that it will help you develop beautiful values such as love, care, nurturing, calmness, confidence and open-heartedness. In addition to this, it helps you gain self-awareness and to take control of your requirements, needs and desires. Another popular piece when it comes to healing gemstone jewelry is the bracelet. Remember when bead bracelets were all the rage in the 90s? We are glad that this piece was and is in fashion again, because those tiny little beads hide exceptional healing powers. Before purchasing a healing gemstone bead bracelet, make sure that the stones are authentic so you can benefit from the healing properties. You can choose to buy a bracelet made entirely out of the same type of crystal beads, or you can mix and match your favorite stones according to your desired purposes for therapy. If you love do-it-yourself projects, you can purchase supplies and make your own healing bracelets at home for yourself or even start a business. These beautiful bracelets are made from semi precious stones and polished to a jewelry quality sheen. They are made are most commonly made from 7mm to 8mm beads and each type of stone grants the wearer certain special benefits. You can wear a bracelet of one type of stone or one with several types. Here are some of the benefits realized by certain semi precious stones. Rose Quartz – Give you compassion. Maybe we should all wear rose quartz! Those are but several on an extensive list of Power Bracelet stones and there special healing properties. This year pendants have taken the internet by storm. On almost all social media websites (especially Tumblr) you can see that pendants are trending for girls in every city, especially if they are teenagers. Little do these girls know that a pendant can actually help them with problems they are facing if they wear them regularly. Some of the most popular healing gemstones used for pendants are various types of quartz, from clear, to rose, to amethyst or Herkimer quartz. Each separate quartz has its own range of healing properties that can help you regain self-confidence and solve your worries. Aside from being a super cute and fresh choice of jewelry, pendants made from healing crystals will protect your from negative energy and allow positivity to flow freely through your life. “Will you marry me?” These are the four words that any girl waits a lifetime to hear. Most engagement or wedding rings are made from diamonds, which are actually one of the most powerful crystals that exist on our planet (both from a physical point of view and a spiritual viewpoint). When it comes to crystal healing, diamonds represent prosperity, wealth and evolution. If you are feeling particularly anxious or are very afraid of something, a diamond might help you feel better. Although diamonds, in particular, are known to enhance all of the chakras, it has an extra special effect on the crown chakra. According to Reiki and energy work teacher Peggy L. Jentoft, “earrings can help balance throat, neck and head energies”. Healing gemstone jewelry in the form of earrings can be worn in several different ways: as small studs with your favorite semi-precious or precious stones, long earrings with gemstones at the bottom, earrings with pendants attached, or hoop earrings with tiny gemstones all around the circles. Like in the case of all healing crystals, you should choose your gemstones for earrings according to your needs and general purpose. Make sure that you always purchase your earrings from a reliable source for healing crystals. If you want to enjoy a special boost of healing energy, you can choose to buy a set of earrings and a matching necklace with the same gemstone. Photo credits: 1, 2, 3, 4, 5, MyHolisticHabits, Etsy.com, Wheretoget.it. 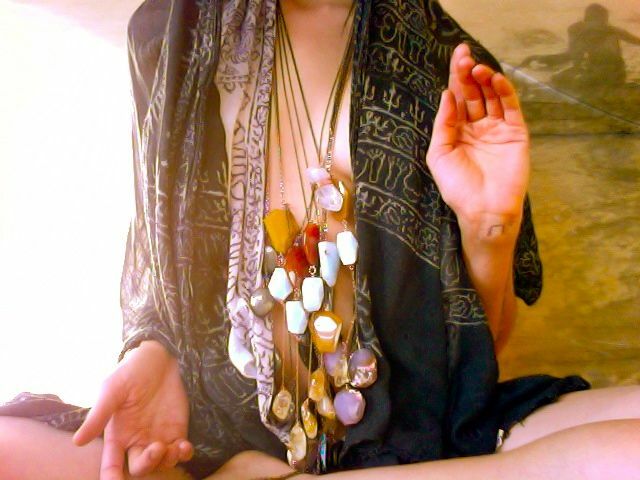 Editors Note: If someone else touches your crystal jewelry, even if it’s just for taking a quick look, you need to cleanse your crystals (especially if you suspect those people to have less than positive vibes towards you). For cleansing crystals, you need to at least wash your crystals under clean water (ie, ocean, natural stream, faucet water) for 3-5 minutes, dry them under the sunlight, or you should keep them in a saline solution for at least 3 days before gradually starting to wear them again. Hey Buddy!, I found this information for you: "6 Gorgeous Types of Healing Gemstone Jewelry". Here is the website link: https://accessgems.com/types-of-healing-gemstone-jewelry/. Thank you.